friendship may be interchanged and eternal"|Nuruddin Salim Jahangir|Letter to James I. The Mughal Empire (Persian: ? ? , Imperatory-e Moghuly-e Hind, self-designation: ?, Gurkanian; Urdu: ? 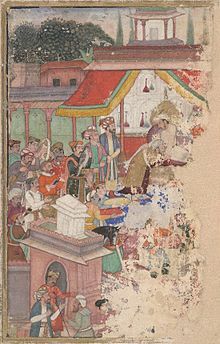 , Moghly-e Soltanat), or Mogul (also Moghul) Empire in traditional English usage, was an imperial power in the Indian subcontinent from about 1526 to 1757 (though it lingered for another century). The Mughal emperors were Muslims and direct descendants of Genghis Khan through Chagatai Khan and Timur. At the height of their power in the late 17th and early 18th centuries, they controlled most of the subcontinent—extending from Bengal in the east to Balochistan in the west, Kashmir in the north to the Kaveri basin in the south. Its population at that time has been estimated as between 110 and 150 million, over a territory of more than 3.2 million square kilometres (1.2 million square miles). The "classic period" of the empire started in 1556 with the accession of Akbar the Great. Under his rule, India enjoyed much cultural and economic progress as well as religious harmony. Akbar was a successful warrior; he also forged martial alliances with several Hindu Rajput kingdoms. Some Rajput kingdoms continued to pose a significant threat to Mughal dominance of northwestern India, but they were subdued by Akbar. The reign of Shah Jahan, the fifth emperor, was the golden age of Mughal architecture and the arts. He erected many splendid monuments, the most famous of which is the legendary Taj Mahal at Agra, as well as the Pearl Mosque, the Red Fort, the Jama Masjid of Delhi, and the Lahore Fort. The Mughal Empire reached the zenith of its territorial expansion during the reign of Aurangzeb. During his lifetime, victories in the south expanded the Mughal Empire to more than 1.25 million square miles, ruling over more than 150 million subjects, nearly 1/4th of the world's population, with a combined GDP of over $90 billion.